October 16, 2018 by Technical Management, Inc. This Winning Insights post discusses key factors in winning major competitions attributed to experience as a defense executive and as a consultant on Winning during the past 50 years. Based on this expertise, TMI is pleased to offer a new series of How-to Best Practice consulting products for the forthcoming dynamics of the 2019-2024 era. Among these are: Entrepreneurial Opportunity Creation; Speed to Need Accelerated Developments; Competing Like a Prime (for Product Companies); Keeping Core Programs Sold; and Technical and Affordability Disruptions. For more information, contact dan@tmiwins.com. Game Breakers (GB) are decisions that are the decisive action (a design choice, a teaming decision, an investment decision, an initiative, etc.) made along the way that ultimately leads to “The Win”. Unlike professional sports—where the GB is often a big NFL play during last two minutes, a winning three-pointer at the buzzer, or a walk-off home run—in major acquisition competitions the decisions that define GBs occur along the way and at the time may not yet be evident as a GB. Often, GBs occur well before the game (competitive acquisition) even begins. This Part I post of a two-part series will describe two categories of game breakers. Category 1 GBs are characterized by the convergence of mission need and an innovative enabling technical solution. The contractor effecting this convergence early on with a substantiated concept design has a head start in influencing the acquisition plan and underlying requirements. Their concept’s mission capability often becomes the centerpiece of the customer’s justification (i.e., the existence proof) for the new start. These GBs occur in advance of the pre-acquisition cycle and before the customer’s Material Development Decision. Category 2 GBs address positioning actions prior to the RFP that strengthen competitive posture. The program examples presented here are classic and remain applicable today and into the future. Part II of this series will address Game Breakers in three additional categories. America’s First Intercontinental Ballistic Missile (ICBM) – After World War II, a key element of U.S. National Security strategy involved staying ahead of the USSR in military technology/mission capability. Nazi Germany’s V2 ballistic missile, Hitler’s Vengeance Weapon 2 used to bombard London in WWII, was the first significant use of ballistic missiles. After WWII a combination of U.S. technical advances—including thrust vectoring of rocket engines (proven earlier on V2), inertial navigation, and dry hydrogen warheads—enabled the technical feasibility of the ICBM. The challenge was to get the range and payload capability in a vehicle that was not too large and heavy to be manageable in transport, storage, and maintenance. General Dynamics’ Convair created its one-and-one-half (1½) stage ATLAS, which was less risky (all 5 rockets, one of which was for the second stage were ignited before takeoff) and more efficient approach than a two-stage vehicle. For the 1½ stage vehicle to accomplish the mission without being unduly heavy, the upper stage required high structural efficiency (i.e., high fuel volume per pound of dry weight.) The high finesse ratio (length/diameter) of the thin-skinned cylindrical upper stage had to withstand the maximum aerodynamic bending stress load during boost. Charles Bossert, a Convair engineer, created the enabling technical solution of pressurizing the liquid fueled upper stage. Pressurization increased the stiffness enough to withstand maximum bending load without having increased skin thickness or added longitudinal stiffeners. ATLAS “leaps off” at 440,000 pounds, of which 409,000 is fuel (highly efficient takeoff weight to empty weight), to propel a 5,000-pound payload 5,500 miles. Thus, a technical innovation GB enabled the ATLAS ICBM. Joint Strike Fighter (JSF) – Between 1983 and 1993, the U.S. government undertook several efforts to study the technologies available to design and manufacture a follow-on stealthy supersonic fighter that could replace the USMC AV-8 Harrier as well as other aging U.S. fighters. Among these efforts were DARPA’s Advanced Short Take Off Vertical Landing (AVSTOL) and NASA’s STOVL Strike Fighter (SSF). These concepts began to show multi-service capability. Several additional studies were conducted. These studies led to the 1994-1996 Joint Advanced Strike Technology (JAST)/Joint Strike Fighter (JSF) Concept Exploration and Concept Definition phase wherein fighter primes were funded to conduct conceptual designs for what ultimately became the Joint Strike Fighter (now the F-35). In analysis, the Lockheed Skunk Works Chief Engineer, Paul Bevilaqua, and his team created the conceptual design of an Integrated Lift Fan Propulsion System (ILFP), which Lockheed was quick to patent. The ILFP concept was viewed both by the customer and internal Lockheed engineers as risky and not yet matured. Lockheed invested in the concept with teammates P&W and Rolls Royce as risk-sharing and investment partners. The team matured, demonstrated, and validated risky elements of ILFP in “miracle of the month” risk mitigation tests. Among the risky elements were the engine-to-fan clutch, drive shaft and bevel-gearbox. These elements would have to divert 29,000 horsepower from the engine’s low-pressure turbine to the lift fan for vertical landings. Also risky were the lightweight counter rotating lift fan and the three bearing swivel module. The ILFP was a the key factor in JSF feasibility and Lockheed’s XF-35B fly-off prototype’s ability to demonstrate the required 500-foot STOL takeoff, supersonic flight, and return with a vertical landing. Unfortunately, Boeing’s XF-32B (other fly off competitor) failed to demo this capability at the required conditions. The ATLAS and JSF Game Breaker examples are two of many where the winning contractor had earlier helped the customer validate the new start with the capability of an innovative technical solution. All are characterized by a contractor’s creative derivation of a need-driven innovative technical design concept that was further perfected by (1) investments to advance the design maturity and (2) risk mitigation demos to reduce risk. There are numerous Category 2 positioning GB actions that often end up being pre-emptive moves. For brevity, this discussion will be limited to two types: teaming to win and investing to win (or combinations of both). MDA Airborne Laser Development – Once Boeing, Lockheed and TRW brought forward a team representing the key system elements (TRW’s laser, Lockheed’s space pointing system, and Boeing’s airplane and role of integrator), the winner’s pre-emptive strength was obvious going in. AIM-9X Air-to-Air Missile – The AIM-9X competition resulted from failed prior attempts (AIM-9M and AIM-9R) to solve the driving requirement counter-countermeasure (CCM) capability. Hughes conducted a comprehensive Competitive Assessment months prior to submitting proposals in a “neck down from three contractors to two” competition for funded 18-month Dem/Val contracts. The Competitive Assessment’s conclusion was Hughes’ competitive shortfall in CCM. An outside consultant recommended Hughes team with Texas Instruments (TI). Despite the Capture Manager’s (CM) urgency to team, Hughes management deliberated for weeks as Hughes engineers made a play to develop the CCM capability in house. Knowing that TI had significant government funded CCM CRAD, Hughes’ CM contacted TI and learned TI was surprised that they hadn’t heard from Hughes. What’s more, TI was about to team with Raytheon. The Hughes’ CM immediately offered TI the teammate role and more work share (although not yet defined). It was an offer TI could not refuse. The Hughes/TI team strength—with Hughes’ earlier development and production of the seeker for UK’s Advanced Short Range Air Missile ASRAM, coupled with TI’s CCM capability—was pre-emptive with an “all blue” DEM/VAL proposal. And, the team’s DEM/VAL test performance validated the CCM capability. The Hughes/ TI team won the development and production contract. US Navy MQ-25 UAV Tanker – The Carrier strike range requirements stemming from the pivot to Asia punctuated the need for a tanker with aerodynamic and structural design efficiencies to provide maximum fuel transfer capability per pound of takeoff gross weight. Boeing allegedly waited until the requirements were finalized and then crafted a clean piece of paper design optimized to meet these requirements. Prior to the award, Boeing invested in a flyable prototype to mitigate risk. Boeing faced a possible deferred investment in price risk with their reported price for the Fixed Price Incentive Fee award being less than half of each of the other two competitors. Boeing likely viewed the opportunity as strategic with the efficient MQ-25 aircraft, ultimately making itself a market above and beyond the planned Navy buy of 72 tankers. This bigger business case may well have been the basis for the “gamey” price. DARPA Have Blue Half-Scale Stealth Demonstrator – In the mid 1970s DARPA held a competition for the Have Blue stealth flyable demonstrator to validate the reduced radar return and the air-worthiness of a stealth vehicle. Lockheed, with its extensive configuration refinement simulation and model testing of radar signature and wind tunnel testing, perfected its faceted Have Blue design. To ensure winning, Lockheed elected to invest its own funds in an amount equal to the funds DARPA had available for the program. Later, stemming from the Have Blue program was the F-117 stealth fighter and the preliminary design of a bomber that prompted the competition for the Advanced Technology Bomber (B-2). Enterprise Investment to Mature New Technology – Almost 10 years ago Raytheon instituted an enterprise-wide investment in Galiun Nitride technology to increase the efficiency and reliability of TR modules for radar and EW applications. This investment GB advanced the TRL level for productized applications. Additionally, program unique pre-RFP investments in demos to mitigate specific customer identified risks, coupled with the industrial engineering benefits (commonality economies of scale, etc.) of applying TR modules across several programs, was a factor enabling Raytheon to win several major competitions. Technical innovation GBs in concept designs focused on the driving requirements—whether they be mission capability and/or affordability—will always help enable the new start and enhance the contractor’s chances of winning. Teaming and investment GBs will continue to emerge as winning power plays. Look for Part II of this series in December 2018, when we will address Game Breakers in three additional categories (two categories involve implementation prior to proposal submittal): Category 3, Winning Technical Solutions; Category 4, Pre-Emptive Pricing; and Category 5, Winning the End Game (actions in the Proposal Evaluation/Source Selection phase). January 17, 2018 by Technical Management, Inc.
Why do axiomatic winners often lose “franchise maker” programs? Reflecting on TMI’s 30 years of consulting and hundreds of engagements on Winning and Performing, we can conclude the following: There seems to be nothing new in winning (or losing) other than the history from which companies have failed to learn. Obviously, in each case, the reasons for winning or losing are situation-based, depending on the character and nature of the program. However, to benefit, historical lessons must be considered in context of the new start’s situational facts. – Low TRL and proposal risk, etc. However, one reason seldom considered is difficult to describe, but is statistically significant: Confusing Winning with Performing. What does this mean? Simply, it is an overemphasis on and concern for performing on the program (if awarded) at the expense of first focusing attention and effort on developing the integrated product offer necessary to win. Management reviews too often emphasize minimizing company exposure to cost and schedule risk to the detriment of helping the capture team create a winning offer. Part I of this two-part Winning Insights post discusses how winning gets confused with performing. Part II (posted March 2018) will present how changes in how business was done enabled successful execution on programs where “gamey” price and “gooey” schedule commitments were necessary to win. 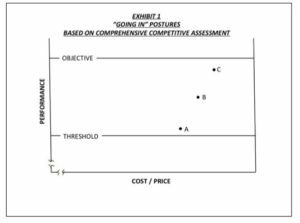 Win Strategy (WS) and Price-to-Win (PTW), derived well in advance of the draft RFP, based on findings from comprehensive Situation and Competitive Assessments, must drive the positioning to win initiatives and tasks. The competitive assessment must be updated along the way to the final RFP: as the requirements are finalized; as competitors team and assert claims about their product’s capabilities; as the Acquisition Strategy changes; or events affecting the program occur. Investment must be made in key personnel and Engineering to Win (CAIV trades (cost vs. performance vs. risk); trade tree rationalization of technical baseline; CONOPS and mission analysis to help customer rationalize best value; TRL maturation; risk mitigation demos; etc.). At least one competitor with a technically acceptable product offer views the opportunity as survival and/or strategic, and bets the business unit in order to win. Internal company approval for this is enabled by crafting a business case value well beyond the profit of the immediate program being bid. And thus, the competitor accepts greater pricing risk. The lower offer price is enabled by forthcoming business model changes crafted to deliver at price bid. The incumbent contractor on the current or recent program, which will be cut back, displaced and/or ultimately replaced by the new start is both “blessed and burdened” by their last success. Competitors exploit the incumbent’s burdens and neutralize its strengths in the context of the new opportunity. One of the competitors significantly enhances its Pwin by teaming to win early on. Others to be discussed in Part II of this series. 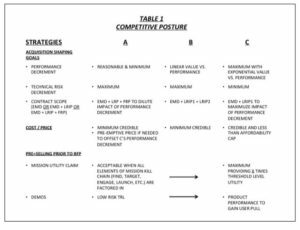 The above characterizes typical positioning decisions and actions of competitors. Meanwhile, what it takes to perform (cost and schedule) on a new start is driven by the inside world of functional managers and process compliance folks, who also want to win. The functional organizations view each new opportunity as a means to develop capabilities and grow their organizations. Also, the “professional manager” syndrome results in “worshiping at the altar” of process, which delays or ignores the hard decisions needed. And compliance folks prompt task expansion with “one size fits all” processes and policies, instead of tailoring and streamlining them driven by what it takes to win as well as execute the program. – Development of evidence and implementation of best practices (comprehensive task and schedule planning; critical path analysis; head start tasks and schedule sensitive risk mitigations to ensure schedule slack and margin, etc., to substantiate an executable schedule. – Organizational and business models driven by efficiency and lower cost. – Strategic and incisive management of the Supply Chain, which now provides 60-80 percent of unit cost on Integrated Systems and System Solution Programs, etc. March 25, 2017 by Technical Management, Inc.
– Superior knowledge on the product being competed. – An engineering organization with up-to-date skills and talented experts current in their subject matter. – A “going concern” production program generating cash. – Infrastructure, facilities, labs, etc., needed for the new program. – Customer intimacy and mission understanding. However, relative to the other competitors (i.e., challengers), incumbents are also burdened with impediments that are often barriers to winning. Paradoxically, many result from the above-mentioned strengths. First, incumbents are “on defense” stemming from their actions to protect and extend their current program. Secondly, incumbents are burdened by elements of their last success as they craft their product offering in response to the RFP. Impediments further manifest in traps that limit the incumbent’s actions and efforts in addressing the issues that matter in positioning for and winning a competition. In the context of winning, the contrasting (challenger versus incumbent) positions on important issues are presented in this Winning Insights post. These positions were derived based on more than 600 consulting engagements on winning, where TMI worked with either challengers or incumbents. 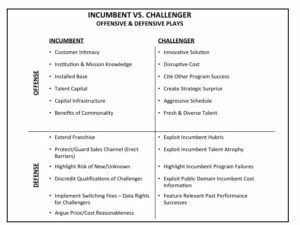 We present a summary of offensive and defensive plays employed by both incumbents and challengers in the table below, followed by a discussion contrasting their responses on positioning to win and proposal offering issues. Focus. In competitions, the challenger focuses on winning while the incumbent’s focus (for too long) is on protecting the existing program, and the contest becomes the past versus the future. Hence, the incumbent is in the protection trap at the expense of positioning to win. Collaboration to Help Customer Validate New Start. The challenger embraces and embellishes the new requirement and helps validate it with mission analysis and demos. The incumbent puts effort, although late, into product improvements, claiming adequate proven capability and low risk. Thus, the incumbent is burdened with the good enough trap that doesn’t address the new needs of the evolving customer set. Also, the challenger is able to contribute more objectively to the customer’s affordability goal determination. Meanwhile, the incumbent views the government’s new affordability goal through the lens of the incumbent’s most recent development problems and cost growth. Hence, the incumbent is caught in its own reality trap. This creates the condition where the customer and challengers are optimistically pushing the new start while incumbent is perceived as resisting it. Estimate of Pwin. The challenger concludes its Pwin is lower because it is the underdog. The incumbent’s Pwin estimate is higher because of their “going concern” strengths with attendant arrogance. The incumbent is burdened with the hubris trap and often puts too little effort into determining how to counter the challenger’s win strategy. Commitment to Win. The challenger’s commitment to the new start is evident early and is consistent. The incumbent is ambivalent until too late. This results from being burdened by the denial trap with respect to whether the new start will really happen. Management Alignment. The challenger’s leadership aligns around winning early. Meanwhile, the incumbent’s leadership is conflicted over protecting and extending the existing program versus fully embracing and committing to winning the new start. For the incumbent, future is the enemy of the present. Staffing the Team. The challenger often selects the best talent from across the enterprise and brings in outside subject matter expertise on the “why” and the “essence” of the acquisition. Unfortunately, the incumbent, when realizing that the competitive acquisition program is really going to happen, selects people from the program organization to lead the effort. Thus, the incumbent starts with the existing team that it believes is the industry’s best. The team resists new talent and ideas and often ignores or rejects the broader innovative trade space needed to win. Tired blood becomes the trap. Investing in Technical Advances to Win. The challenger illustrates the benefits of technology advances as the disruptive enabler for winning. The incumbent attempts to discredit the advance as not really necessary for the mission or too risky and will cost more. The incumbent resists moving out of its comfort zone trap. Performance Confidence. The challenger features its prior successes. And, it will use the incumbent’s recognized contract performance problems and the new program’s anticipated management challenges to drive acceptance of its technical and management response. This results in higher confidence for an executable program that is enabled by the challenger’s offer of design margins, schedule margins, and affordability trade hedges to provide cost margins. Conversely, the incumbent spends too much effort explaining and rationalizing what happened on its program of record. Thus, the incumbent is trapped in the “Mea Culpa” of circumstance. Product Baseline Design. The challenger has the freedom, and is anxious to reflect more customer suggestions and concerns in a more open trade tree optimized design. And, since the incumbent has the benefit of its development experience on its current program, it is unlikely to make enough new and fresh trade choices in selecting its design configuration. It will feature commonality from existing program at the expense of originality driven by the new start requirements. Incumbents are burdened by their last success. Schedule. The challenger offers the schedule that the customer desires to hear to support key acquisition milestone dates (e.g., first flight, OT&E, Initial Operational Capability, etc.). Additionally, the challenger invests in head start tasks and risk demos to ensure that its schedule is evaluated as credible and executable. The incumbent, with its superior knowledge and incisiveness based on how long it took last time, will credibly claim schedule certainty, which may not fit well in the current acquisition plan schedule. The incumbent is burdened with knowing too much and feels righteous in its realism trap. Cost. The incumbent’s costs on the program of record are likely known by the challenger, who will adjust them for the product, process, and rate differences (between the incumbent’s program of record and the new program being bid). This enables the challenger to establish the incumbent’s likely cost for the new program. The challenger then sets its cost goal to be less than the incumbent’s likely cost. The challenger then determines its price to win (PTW). 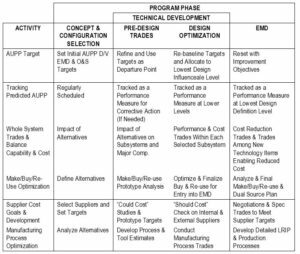 The PTW is allocated across the EMD and Production Work Breakdown Structures to determine its Design-to Unit goals and its Buy-to goals for the vendor-provided Bill of Materials. Trades of performance versus cost and risk are used to inform configuration choices driven by cost goals. Meanwhile, the incumbent, with prior program actuals, will claim very credible basis of estimates (BOEs). And with its superior knowledge of the tasks to be accomplished and its incisive awareness of the prior program’s “unknowns”, the incumbent is likely to estimate higher costs and associated price than the challenger. Thus, superior knowledge and recent actuals as BOEs set the stage for the too smart to bid competitive trap. Price. The challenger will use the incumbent’s current unit price as the benchmark and adjust it for differences between the incumbent’s current product configuration and its likely configuration for the new program. Thus, the challenger can rationally “target” the incumbent’s likely price and reflect it in its Price to Win derivation. The incumbent—with its credible, substantiated claims of cost/price reasonableness, realism and completeness—will likely bid higher than the challenger. The incumbent is in the burdened with actuals trap. Propensity to Take Price Risk. Throughout the pre-RFP effort, the challenger capture team and top management leadership are aligned and committed to win. The challenger will likely bid “just incredible enough” to win.” Meanwhile, the incumbent, for the reasons mentioned above, will likely bid “just credible enough” to lose. The incumbent is often trapped by being “snake bitten” a few too many times, having realized risk driven cost increases on the current program. TMI’s next Winning Insights post (May 2017) will address best practices and specific hedges to turn each the incumbent’s traps into strengths. In general, the hedges require the exercise of imperatives by leadership early on to ensure the hedges are not too little, too late.